There’s a lot to learn about swimming. From different strokes, to more advanced events like synchronized swimming, dive in and learn more about this sport. And don’t forget your swim cap! Think you know the secret to winning a freestyle, a backstroke, butterfly, or breaststroke race? When did competive swimming become a part of the Olympics? Swimming has been apart of the modern Olympic games since they began, in 1896. The International Olympic Committee recognizes 34 separate competitive swimming events. There are 17 events and 34 competitive events because both have a male and female component. Some of the events include freestyle races, relay races, and a 10km marathon. 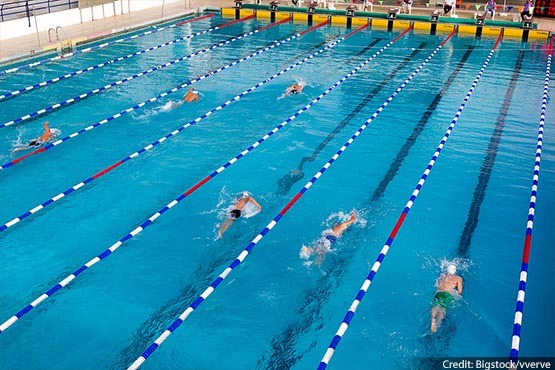 Olympic swimming events have been held in pools since 1910. Which body of water did they not take place in for the first four years of the Olympic games? In the first four Olympics, competitions were held in open water instead of large pools. For example, contestants swam in the Mediterranean in 1900, the Seine in 1904, an artificial lake in 1904, and the Mediterranean again in 1906. Michael Phelps holds world records in how many swimming events? Phelps holds seven world records, all set at the 2008 Olympic games. The records are in three team and four individual events. How many calories does Michael Phelps regularly consume during training? Some of the typical meals include an entire pizza plus a pound of pasta for dinner, washed down with energy drinks. Don’t try that at home. Swim caps serve many purposes depending on why you’re swimming. But for competitive swimmers, they can reduce resistance, and possible help goggles stay on.